By Dr. Eva Evans, a veterinarian and writer for the Pets Best Pet Insurance Agency, offering pet health insurance for puppies and dogs. In honor of National Puppy Day, here are some fun facts about puppies. Do you have a new puppy at home? 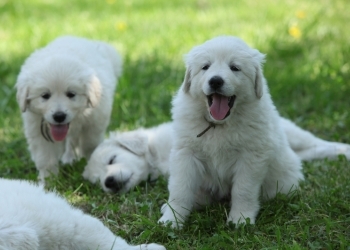 Do you know the important milestones of puppy development? Find them out below! 1. When do puppies lose their baby teeth? Puppies begin losing their baby teeth around 12-16 weeks of age. The first teeth that fall out are the incisors (the tiny little teeth at the front of the mouth). Around age 4-6 months, puppies will lose their canine teeth which are those sharp little fang teeth. Puppies lose their molars last, usually around 5-7 months of age. The age at which your puppy will lose its baby teeth depends on the breed and size of the dog. 2. When will my puppy be house trained? As soon as you get your new puppy you can begin the process of house training and teaching the puppy to go potty outside. However, if you don’t provide enough trips outdoors, your puppy may not be able to hold it for very long! As a rule of thumb, you can expect your puppy to hold its bladder for 1 hour for every month of its age. That means that a 5-month-old puppy cannot be expected to hold his bladder for more than 5 hours. Your best bet for minimizing accidents is to take your puppy outside to potty right after he wakes up from a nap and right after eating and playing. Once puppies reach 6 months and older, they have full control over their bladders and they can start to sharpen their housetraining skills into perfection as adults. Keep in mind that even older puppies and adult dogs can still have accidents in the house sometimes! 3. When will my puppy lose his baby fur? There’s nothing as soft as puppy fur. This fluffy baby coat is typically shed around 6 months of age. However, the breed, time of year and exposure to light all affect the hair growth cycle. Some breeds will take even longer to shed their puppy coat and replace it with an adult coat. Keep your puppy well groomed and brushed to minimize shedding in the house. 4. When will my puppy mellow out? This depends on the puppy! Smaller breeds reach maturity faster than larger breeds. Usually, dogs reach maturity between 6 months and 1.5 years of age. For example, your 1-year-old Chihuahua might be completely mellow, but a 1-year-old Great Dane might still act like a puppy. Often, dogs will still have excess energy as young adults for a few years after puppyhood. The breed is another factor in determining when an individual dog will mellow. Some breeds are mellower than others naturally, and some breeds are highly active. The point at which your puppy will stop acting like a puppy really depends on the breed and the individual. Some of us are always young at heart!